When traveling along 3rd Avenue in Beaver, we are in the rear of the Waffles Incaffeinated & Herban Touch Juice Labs building and adjacent to the Beaver Police Station. From Third Street: Enter alley between Municipal building and The Herban Touch Juice Lab, turn left at end of building & parking is against the building with white staircase and elevator. 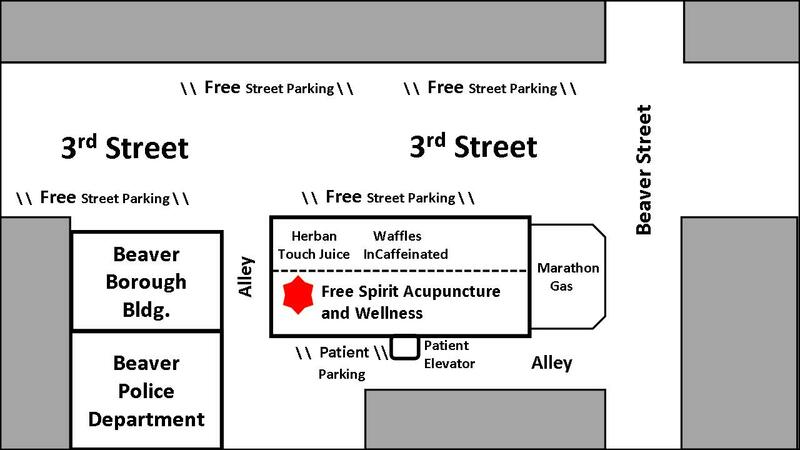 From Beaver Street: Follow alley behind Marathon gas station until police station is in front of you, entrance to Free Spirit is to the right, parking is against the building. The clinic has free parking available outside the practice, as well as free street parking along 3rd street and side streets were permitted. Handicapped parking is available directly in front of the clinic along with elevator access to the second floor. Please call us if you need special assistance with parking 724-774-8729. Just 45 minutes from downtown Pittsburgh.